Note: This legacy guide covers Unity Ads integration in C# using the Advertisement API, which is still fully supported. However, Unity recommends using the Monetization API available in SDK versions 3.0+, to take advantage of advanced optimization features. For more information, click here. Configure your project for a supported platform using the Build Settings window. 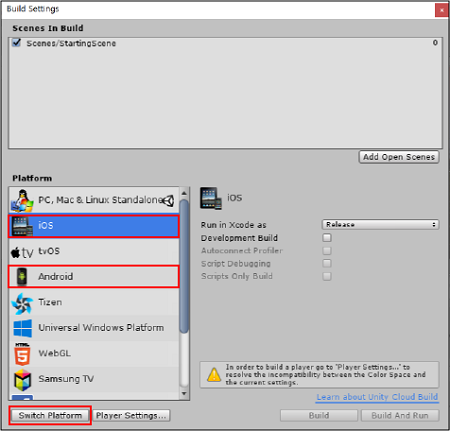 Set the platform to iOS or Android, then click Switch Platform. This process varies slightly depending on your integration preference; the Services Window method or the Asset Package method. To enable Ads, you need to configure your project for Unity Services. This requires setting an Organization and Project Name. See documentation on setting up Services. In the Unity Editor, select Window > Services to open the Services window. Select Ads from the Services window menu. Click the toggle to the right to enable the Ads Service (see image below). Specify whether your product targets children under 13, by clicking in the checkbox then click Continue. Download the latest SDK from the Asset store. For information on downloading and installing Asset packages, see Asset packages documentation. Placements are triggered events within your game that display monetization content. Manage Placements from the Operate tab of the Developer Dashboard by selecting your Project, then selecting Monetization > Placements from the left navigation bar. Select Rewarded to allow players to opt-in to viewing ads in exchange for incentives. Rewarded Placements do not allow the player to skip the ad. Every Unity Ads-enabled project has a (non-rewarded) ‘video’ and (rewarded) ‘rewardedVideo’ Placement by default. Feel free to use one of these for your first implementation if they suit your needs, or create your own. To initialize the SDK, you must reference your Project’s Game ID for the appropriate platform. You can locate the ID on the Operate tab of the Developer Dashboard by selecting the Project, then selecting Monetization > Platforms from the left navigation bar. With the Service enabled and Placement created, simply call the Show method to display an ad. Rewarding players for watching ads increases user engagement, resulting in higher revenue. For example, games may reward players with in-game currency, consumables, additional lives, or experience-multipliers. To reward players for completing a video ad, use the HandleShowResult callback method in the example below. Be sure to check that the result is equal to ShowResult.Finished, to verify that the user hasn't skipped the ad. In your script, add a callback method. Pass the method as a parameter when when calling Show. Call Show with the "rewardedVideo" placement to make the video unskippable. // Reward your player here. Use the code below to create a rewarded ads button. The ads button displays an ad when pressed as long as ads are available. Select Game Object > UI > Button to add a button to your Scene. Select the button you added to your Scene, then add a script component to it using the Inspector. (In the Inspector, select Add Component > New Script .) Name the script UnityAdsButton to match the class name. Note: If you are using engine integrated version of Ads SDK, you need to remove the two sections of code that are marked with ONLY NECESSARY FOR ASSET PACKAGE INTEGRATION. Press Play in the Unity Editor to test the Ads button integration. For further guidance, see the Unity Ads forum. Use the Developer Dashboard to modify placements and other game-specific settings in your project. In your web browser, navigate to the Unity Ads Dashboard, using your Unity Developer Network UDN Account, and locate the project for your game. Select an applicable platform (iOS or Android).